As the world becomes increasingly digital it’s easy to forget that paper documents can leave you open to the risk of identity theft and other breaches of personal security. Once your rubbish leaves your property it’s legal for anyone to take! One of the easiest precautions you can take against identity theft is ensuring no document revealing personal information gets thrown whole into the trash or lies around on your desk for anyone to see. Keep reading to find our top 9 documents to shred immediately. 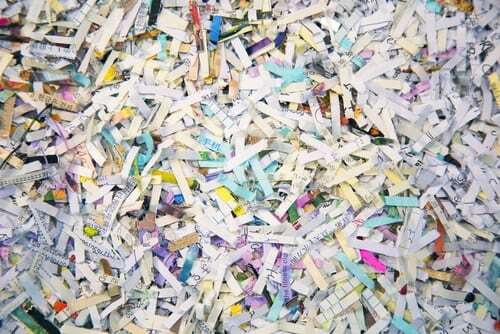 You should shred bank statements as soon as you’ve processed any necessary information. This includes ATM receipts, deposit and withdrawal slips. These documents, including credit card statements, often contain key personal information about your account, identity and spending habits so should be destroyed or kept in a safe place. Pay slips don’t just give away details about your incomes. They contain key personal information about your employment, taxes and even health care. After you’ve verified any information you should shred them before disposing of them. Did you know that the barcodes on junk mail could contain sensitive information? Also, any special offer could be applied for on your behalf if it gets into the wrong hands. We recommend getting into the habit of shredding and disposing of your junk mail regularly. Tax returns should be saved for at least 5-7 years. After this, it’s important to shred them before disposing of them. It helps to keep organised records of your tax returns, so you can shred not only the returns themselves but all the receipts and documentation that is no longer needed. Personal medical records including any bills, receipts or test results should be destroyed as soon as the information isn’t needed any more. This is private information that contains personal information that needs to be protected. Insurance documents are a potential gold mine of information for unsavoury characters. As with any documents, be discerning as to what you keep on file and ensure the rest are properly destroyed. Boarding passes contain key personal information especially if a criminal has access to a barcode scanner. To protect details such as your birth date, nationality and passport number, shred any old boarding passes straight away. Expired passports or other forms of ID should be destroyed and disposed of immediately. If a criminal gets their hands on one of these, it’s practically an invitation for them to steal your identity. This goes for any photocopies of your passport or ID that you no longer have use for. If you receive paper benefit statements from the Government, it’s crucial to store these securely and destroy them when they are no longer needed. No matter what benefit you are on, these statements contain crucial personal information that needs to be protected. Based in Melbourne, In Confidence can help you with your document destruction needs. We recommend evaluating your records based on this list and collating any documents that need to be shredded. From there, we can arrange collection and destruction with the utmost commitment to your personal security. Give us a call today on 1300 723 187.